Balance sheets look strong, but food companies are holding the line on capital projects, projecting only a 5.4 percent increase this year. Our survey of 37 of the largest publicly held food and beverage companies turns up a 5.4 percent budgeted increase for capital outlays this in 2013. The companies for which we have both 2012 budgets and actual spending tightened the purse strings during the year and underspent their budgets by 8 percent. Access the list in a PDF. "Cash rich and shovel shy" may best characterize food and beverage companies' current approach to capital projects. Macroeconomic factors and market uncertainty continue to argue for a take-it-slow approach to plant expansions and improvements. The financial implosion of 2008 dragged down all sectors of the economy. Despite economic hardship, people stubbornly refused to starve, however, and food companies have been able to repair their balance sheets and pay down debt. Signs of life for capital spending appeared last year, but it's premature to proclaim, Laissez les bon temps roulez! Instead, our survey of 37 of the largest publicly held food and beverage companies turns up only a 5.4 percent budgeted increase for capital outlays this year. We emphasize the word "budgeted." Last year this report predicted a 4.1 percent increase, but if you look at the table on the following page, these companies tightened the purse strings during the course of 2012 and underspent their budgets by 8 percent. The early months of the year are when processors secure funding for capital projects, but lenders report an eerie quiet in 2013. "We're hungry to finance projects, but nobody is coming," notes Elizabeth Hund, head of the food industries division at US Bank in Denver. "I have never seen the industry in such good shape financially, but capital investments haven't rebooted." They won't show up on food companies' balance sheets, but third-party funded renewable-energy projects are sprouting up throughout the country, burnishing the industry's reputation while resolving waste disposal issues. A prominent example is the biogas system being built adjacent to Campbell Soup Co.'s plant in Napoleon, Ohio. The 2.2 MW energy system will be fueled primarily by the facility's food waste, which will flow into an anaerobic digester to generate methane for conversion to electricity. The system is being funded by CH4 Biogas LLC and BNB Renewable Energy, with debt guarantees from Eksport Kredit Fonden, the export credit agency for the nation of Denmark, home to the engineering firm that developed the biogas system. An even larger $28.5 million biogas project is underway in Turtle Lake, Wis., under the auspices of GreenWhey Energy Inc. As the name implies, five cheese makers and other dairy operations will pump up to 500,000 gallons of wastewater a day to GreenWhey's site. The digester is expected to supply 3.2 MW of electricity, as well as cogenerated thermal energy for process heating. Financial consulting was provided by Baker Tilly Capital. Wastewater disposal fees are a financial drag for many food companies, but infrastructure investments are a low priority, notes Brad DeNoyer, leader of Milwaukee-based Baker Tilly's food & beverage practice. However, many investors are drawn to these types of projects, particularly when methane is converted to electricity, which qualifies for a 30 percent investment tax credit. The economics might also get a boost from the renewable identification number (RIN) program for advanced biodiesel. Although food currently is not an allowable feedstock, the Environmental Protection Agency is being lobbied to extend RIN to include food waste, according to DeNoyer. At publicly trade firms, capital expenditures compete for available cash with acquisitions and the care and feeding of stockholders. Stockholders are the big winners in recent years, with aggressive stock buybacks augmenting investor returns. Campbell Soup and ConAgra each repurchased 17 percent of outstanding shares in 2012, and ConAgra also was on an MandA bender. After warming up with four small acquisitions, ConAgra's long courtship of Ralcorp Holdings ended with a resounding "I do" when Ralcorp accepted a $4.5 billion rock. Capital expenditures, on the other hand, dropped 28 percent, totaling $337 million. But, it's worth noting, ConAgra has a fiscal year that ends May 29, so the suddenly bigger Omaha, Neb., company probably will pump up its capital budget for its fiscal 2014, which starts in just two months. Architectural and engineering companies rely on major expansions and greenfield projects to pay their bills, and the 2009-2011 period was bleak. Last year saw a revival, although 2013 is merely sustaining the rebound. "I wouldn't call it bullish," says Mark Shambaugh, CEO of Fort Wayne, Ind.-based Shambaugh and Son. "There are still a lot of on-the-fence projects," with economic uncertainty resulting in restrained spending by both public and privately held food companies. His company was the design/build firm for the magilla of all greenfields: Chobani's Twin Falls, Idaho, yogurt plant, which came on line early this year. Fully equipped, the facility represents a $450 million investment, dwarfing other new-plant projects. That level of spending may be an aberration, but it will impact other industry sectors. Together, Chobani's newest facility and the soon-to-be-completed Muller-Pepsico yogurt plant in upstate New York will generate byproducts that will create production opportunities for other manufacturers. American-style Greek yogurt typically is made with low-fat milk. Before pasteurizing raw milk, yogurt processors separate the fat and sell it for other uses. Sales of Greek yogurt and butter prices are moving in opposite directions. Rising supplies also present capacity-expansion opportunities for creameries and other milk fat users. One of Chobani's new Idaho neighbors is Glanbia USA, which specializes in fractionating milk solids, primarily proteins. If research on isolating elements in fat pays off, Glanbia could tap into a huge source of locally available raw materials. Another ripple effect from a million-square-foot dairy is that, within 36 months, hundreds of thousands of spent milking cows will start moving into retirement. That will spur capital projects for Italian meatball manufacturers and others. New-plant construction has trended downward since 2006, when America's real estate bubble peaked. Modernization programs at several major food companies are winding down, though a number of brick and mortar projects continue to come on line. J.M. Smucker goosed its spending plans three years ago when it unveiled Project Heritage, a plant rationalization and new facilities initiative. Most of the work is now in the rearview mirror; budgeted spending is down 23 percent in fiscal 2013. The same year Smucker started Project Heritage, Hershey Co. announced its Next Century project, a similar effort to modernize facilities and replace obsolete plants. Next Century also is expected to wind down after this year. The power of automation to downsize the workforce is reflected in both initiatives. Hershey expected to eliminate 500-600 jobs by shuttering a century-old plant and spending $226 million to modernize and expand its West Hershey facility. Smucker also replaced a legacy facility in its Ohio hometown, sharply increasing capacity while eliminating 700 positions, or 40 percent of the staff. Another 150 layoffs were calculated from the closing of two additional plants, although growing peanut butter sales prompted Smucker to pivot on the previously announced shutdown of a Memphis facility. Instead, the ROI on equipment upgrades proved irresistible when local authorities delivered $6.3 million in tax breaks for the plant. Even more dramatic reductions in force are playing out in Idaho, where J.R. Simplot is completing work on a highly automated potato processing plant. Production from three existing facilities will be consolidated, resulting in a net loss of 500 jobs. At an estimated cost of $330 million, CEO Bill Whitacre describes it as the company's largest single investment in its home state. High feed prices and uncertain demand have conspired to put some greenfield plans on hold in the protein sector. Sanderson Farms pulled the plug on a new facility that had been announced last August, although other factors also were in play. After the selection of Nash County, N.C., was announced, individuals in a neighboring county filed a slew of legal challenges. Economic development agencies are not just hungry, they are litigious. What's inside the building is more important than the walls that surround the equipment, of course, and food companies are updating their machinery and installing advanced technology at a steady pace. The investments are as likely to occur in the mid-tier market as at major corporations' plants, according to Chris Nay, senior managing director of food and beverage in the Chicago office of GE Capital, Corporate Finance. What were the top projects in 2013? One of the largest capital projects this year among publicly traded food companies is a $27 million beverage line relocation to Campbell Soup's Paris, Texas, plant. See what they and other publicly held food and beverage companies been doing. Access the list in a PDF. Lending a sense of urgency to projects is the uncertain future of accelerated depreciation schedules. The so-called bonus depreciation was renewed for 2013, but future tax advantages depend on action by a dysfunctional Congress. Given the uncertainty, many privately held food companies are pulling the trigger now on improvement projects, says Nay. Tyson Foods is more focused on value-added production than bricks and mortar. No new plants are on the horizon or in the recent past, but the company is in the midst of $40 million in production improvements at four facilities. The majority of the spending was in Glen Allen, Va., and Jacksonville, Fla., at plants serving foodservice customers. Retail-oriented facilities in Goodlettsville, Tenn., and Sherman, Texas, are still adding capacity to produce case-ready meats. Outlays to support food safety initiatives are a high priority, as are plant-floor investments to boost efficiency and capacity, says Nay. Snack food manufacturers have been particularly aggressive, thanks to innovative new products and the transition to better-for-you snacks. Food safety concerns and migration to natural ingredients are rippling down to the supplier level. To lower water activity and extend shelf life, many suppliers of flavors and fragrances are turning to spray drying, reports Richard DiBernardo, project engineering director at Initech, a Saddle Brook, N.J., engineering firm specializing in batching systems. Both tolling services and ingredient suppliers are adding spray driers to meet rising demand. "Industry-wide, there is a general capacity issue," he says. 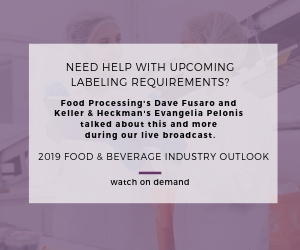 Food safety is a big driver, particularly among protein processors, seconds Kurt Warzynski, process engineering manager at Jacksonville, Fla.-based Stellar. "There's also heavy growth in beverages now," and his firm is engaged in a number of projects for makers of energy drinks, all-natural refreshments and meal-replacement drinks. Indeed, one of the largest capital projects this year among publicly traded food companies is a $27 million beverage line relocation to Campbell Soup's Paris, Texas, plant. In addition to food safety and capacity increases, a desire to be the low-cost provider drives many capital projects. The majority of AB-Inbev's capital expenditures are targeted at production improvements at its facilities, which now include four China breweries purchased in September for $400 million. Many mid-market processors also are investing in their facilities to become or maintain their stature as the low-cost supplier in their segment. Red Gold, one of the last tomato canners still standing in a state that once boasted hundreds of operations, has poured more than $200 million into its three Indiana plants in the past 10 years. Automated, high-speed filling lines were installed in all three facilities in the past three years to help Red Gold take more share in foodservice and private label, where it is a supplier of ketchup, canned tomatoes, salsa and pasta sauces. The financial crisis wreaked havoc on many small and mid-sized firms' balance sheets, but most have recovered and are able to borrow again to fund plant efficiency projects, according to Brad DeNoyer, leader of Baker Tilly's food and beverage lending portfolio. "There are some record profits being generated at all levels," says DeNoyer, who is based in the lender's Milwaukee office. "If their balance sheets are shored up, banks are ready to start lending again." Baker Tilly takes a less favorable view of brick and mortar projects than investments for food safety upgrades, capacity expansions and initiatives designed to capture a bigger market share. Increasingly, those share gains are realized globally. The export market, DeNoyer notes, "is no longer just for the big guys. The world is really shrinking." Exports were nonexistent seven years ago at CK Products, a niche supplier of pastry decorating supplies in Fort Wayne, Ind. Today, the company is shipping icings and other products to 62 countries, with Australia, Japan and the UK accounting for most of the activity. Exports now account for 20 percent of sales, and general manager Steve Burdick expects exports to accelerate as global customers discover CK's hard-to-source inventory. "We're like the Grainger of cake decorating," he boasts. Mid-market companies on the East and West coasts and the Southeast are very active in export sales, "and it's the smaller guys who are driving California exports," suggests U.S. Bank's Hund. "Everybody is looking outward." That includes U.S.-based multinationals, particularly protein processors who are leveraging the nation's farming efficiencies and world-class supply chain, she adds. Some countries require domestic production, and a common tactic is to partner with a local food company, learn the market and then acquire the partner. That was Kellogg Co.'s approach in Turkey and China, two of the emerging markets that generate $2 billion in annual sales for the purveyor of breakfast foods and snacks. At a recent investment presentation, Kellogg pegged foreign sales at 14 percent of its total, behind the shares of pacesetters Kraft Foods (25 percent), H.J. Heinz (21 percent) and McCormick and Co. (16 percent). Offshore production isn't always possible. To slake foreigners' taste for Kentucky bourbon, Beam Inc. is budgeting a double-digit capex increase for greater distilling capacity and more oak barrels. Superior raw materials availability prompted Oberto Brands to repatriate production a few years ago. The decision, along with the return of the Atkins diet, helped the Kent, Wash., maker of beef jerky double its sales. As a result, a second plant is opening this year in Nashville, Tenn. Diet fads drive many consumption shifts and capacity expansions, some of which require facility expansions. In the coming years, those consumption shifts increasingly will occur in other countries, with U.S. food companies meeting the demand. Exports are growing despite the strength of the U.S. dollar. "Right now, we're the prettiest dog in the pack," says Hund, but when foreign currencies gain strength, American-made food will become even more affordable overseas. That will drive food companies to install more high-speed lines, likely inside existing buildings. Our annual Capital Spending Report foresees a 20 percent increase.